Land ownership records can be another valuable source of family history information. These records are kept by the Recorder of Deeds in counties in almost all states. However, until state records laws came into effect, recording these documents was voluntary - and early records are far from complete. The records were normally kept chronologically in large volumes - each covering a designated period of time. Since there are typically hundreds of such volumes for a county, it's important to know that there are normally Grantor and Grantee indexes available listing land sellers and buyers over longer time periods - with references to the specific book and page where a specific deed can be found. While these are nominally alphabetical listings, in some case they aren't actually completely alphabetical - sometimes consisting of groupings of transactions for all names starting with a specific letter listed together somewhat chronologically. In addition to family data that might not be found elsewhere, these records provide a unique perspective regarding exactly where your ancestors lived at a specific time. This, along with local, state, and national history can help explain many things and give you an understanding of how your ancestors lived, who their neighbors were, what was happening around them and, perhaps, why they moved on. Sometimes knowing exactly where the family lived can also help you to locate local cemeteries where family members may have been buried - perhaps with tombstones that can provide more details about family members. In addition, "deed" records can consist of other types of documents that individuals wanted legally recorded but that didn't fit into a neat category. I've found "Power of Attorney" documents recorded along with deeds that were very helpful in understanding a family - but that didn't really have anything to do with land ownership. For instance, one 1816 record in Kentucky documenting power of attorney granted to a friend or relative for purpose of representing the person's interests in the estate of the individual's father in Virginia. Deeds in states with regular survey grids make it relatively easy to pinpoint exact locations for property using a plat map. However, states formed before Ohio in 1808 didn't have such systematic geographical references and used property descriptions based on "Metes and Bounds" - so specific locations can be very hard to determine. Surveys for land grants and purchases in Kentucky and Tennessee are examples. Early deeds and surveys based on "Metes and Bounds" often referenced landmarks that were known at the time of the deed or survey - but that became indeterminate in later years. These included references to specific trees that had been marked with a blaze or with initials, references to the property lines of adjacent land owners - who also had deeds with markings that were indeterminate in later years, references to water courses that may have been known by different names at different times, and, in Kentucky, a common expression in land grants stating that the property extended in a specified direction "for quantity" or "for compliment". The latter meant that the front and sides of a property may have been marked - but that it extended off into the distance far enough to constitute the specified number of acres. This was common in land grants and, thus, it was common that descriptions overlapped or conflicted with other surveys. One Recorder of Deeds in Kentucky stated to me that "if all the grants 'for quantity' in Kentucky had been valid and non-overlapping the state would have to be larger than Alaska." Needless to say, in later years these conflicting claims resulted in all kinds of problems among landowners. The difficulty in proving land claims in Kentucky was one contributing factor in causing many of the early settlers to move on - among them, notably, Daniel Boone, who moved on to Missouri at least partly because of problems with such conflicting land claims and the resulting difficulty in establishing clear title to land in Kentucky. 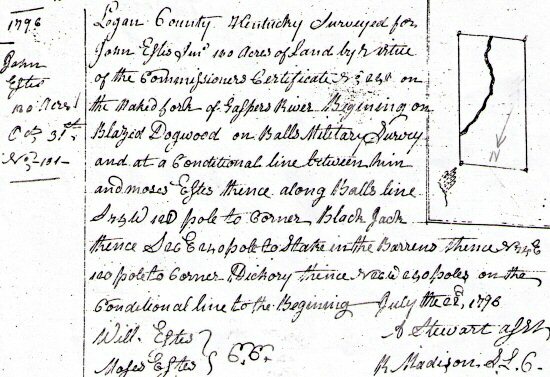 Below are a couple of typical land descriptions for early land grants in Kentucky. Moses Estes enters 200 acres of land in Logan County by virtue of certificate No. 250 beginning at a blazed Dogwood tree being a conditional line between Moses and John Estes running east on Ball's line as far as convenient, including his improvement. John Estes, Senr. 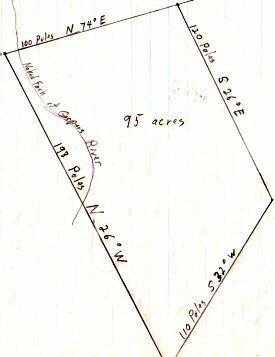 enters 200 acres of land in Logan County by virtue of certificate No. 248 beginning at a blazed Dogwood tree running on an old line said to be Burgis Balls on the naked fork of Gaspers River thence southwardly for compliment being a conditional line between himself and Moses Estes to include his improvement. The above two grants by the Commonwealth of Kentucky were "grants for the relief of settlers south of the Green River". The area south of the Green River had originally been reserved for military land grants for officers of the Revolutionary War. While some of it had been claimed, little had been occupied by the claimants. Many "squatters" had occupied parts of this land which was not being used or had not been claimed. In particular, some of it was occupied by people such as the above Moses and John Estes who had joined James Robertson's group that had founded the settlement at Fort Nashboro (now Nashville, TN) but who had temporarily abandoned that settlement and moved back north into Kentucky due to the constant attacks during the 1790s by the Indian tribes who were attempting to remove that settlement from their ancestral hunting grounds. The land grants by Kentucky were intended to give these "squatters" legal rights to the land that they occupied. The reference to their "improvements" (meaning a clearing and a log cabin) indicated that these people were already living on that property. 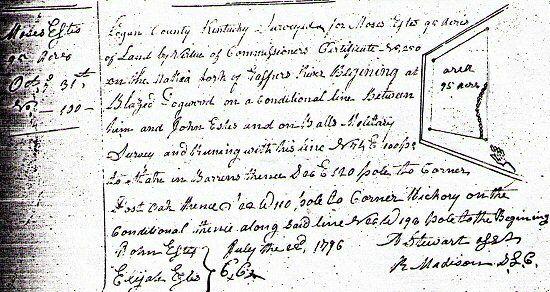 On July 4, 1796, two days before his land grant was obtained, Moses Estes had married Elizabeth Riley in Logan County, Kentucky. They were my gr.gr.gr.grandparents. The second grant was to John Estes, Sr. John and his wife Elizabeth (Chisum) were the parents of Moses Estes. 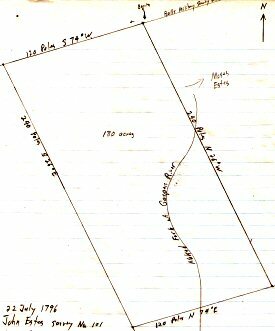 Having found records of land grants such as those above how can you determine where they were actually located? Following is a summary of how I pinpointed the locations of the two 1796 Estes grants. The first step after locating a grant is to try to find a survey for the property - which, if it exists, will be in a separate record book. In this case, Logan County, Kentucky Survey Book "A" includes surveys for the above two Estes land grants - plus other surveys for grants and purchase by other members of the Estes family adjoining these. But, from other records in Logan and Warren Counties, it was clear that the Estes lands were in a part of Logan County that became Warren County in 1797. The two land grants for Moses and John Estes were located on "The Naked Fork of Gaspers River" - and it took some research of old maps to determine that this water course is what is now called "Brush Creek". The surveys included outlines of the boundaries of the surveys and a sketch of how the stream flowed through the properties. 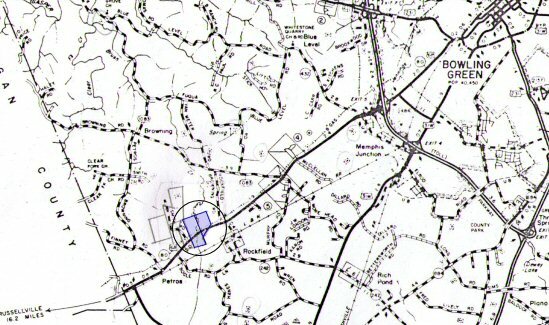 By drawing sketches of the surveys and overlaying them on a modern day map of Warren County matched to the same scale it was possible to determine exactly where the land was located along the current Russellville Road about 10 miles southwest of Bowling Green Kentucky. Below are images of the original survey documents, my scaled sketches of the surveys, and a copy of part of the Warren County map showing where the lands were located. Note that, although both of the above land grants were for "200 acres of land", the actual surveys contained 95 acres and 180 acres. In the surveys, note that the common surveyor's units of measurement were a "pole" or its equivalent - "rod" or "perch" - i.e., 16-1/2 feet, or a chain, which was 4 poles or 66 feet. Sometimes you will find references to "links". There were 100 links in a surveyor's chain - so a link was 0.66 feet (7.92 inches). The people referenced at the bottom of a survey document as C.C. were the "chain carriers". The surveyor's chains were heavy!